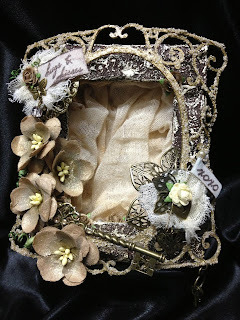 I've altered another Twiddleybitz shadow box!! 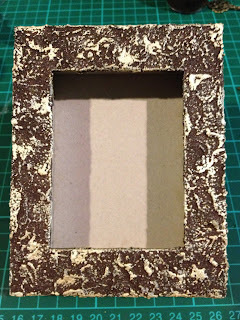 Once the shadowbox was assembled using PVA, I started with Ferro Iron to cover the outsides (that's the brown); then rubbed over the surface with Inka Gold - I LOVE how this brings out all the texture! 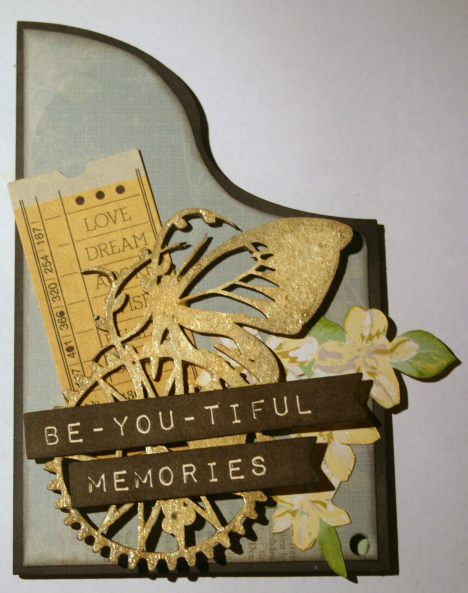 Thanks for joining me today - I hope you enjoyed my post and will try our gorgeous range of Shadow Boxes. It really doesn't matter what your scrapping style is - we have one perfect for you! 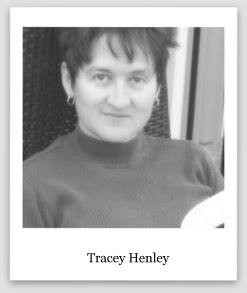 Hi and Welcome Twiddley Fans! 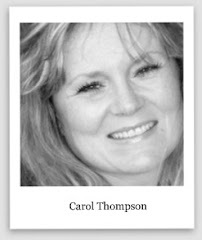 Our Design Team gal TRUDI HARRISON is with us today. 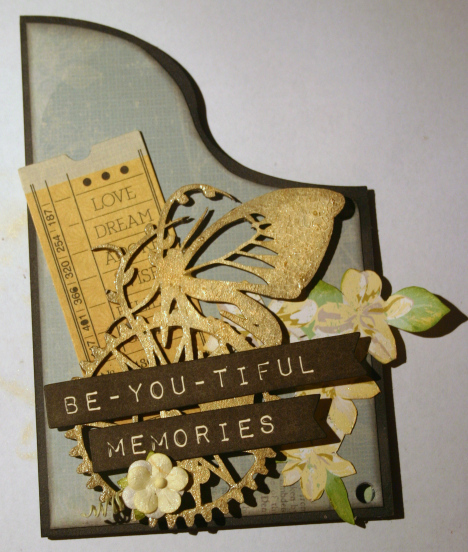 This is one way which Trudi really likes to alter Twiddleybitz chipboard. 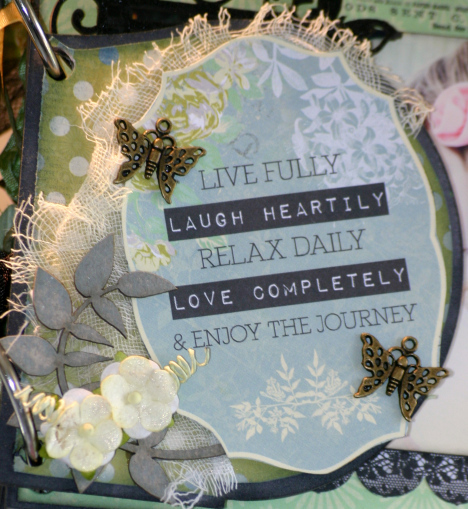 This technique is great for adding texture and interest and the colours can easily be altered to suit any project. 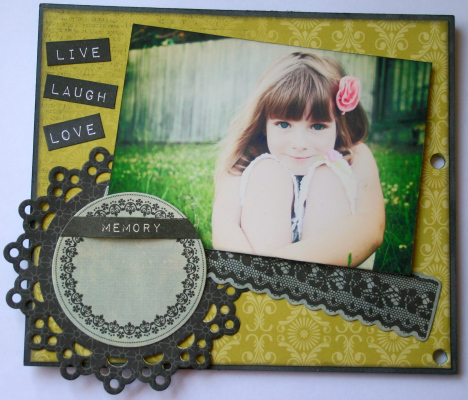 Today I thought a little something more on the grungy side would be a nice effect to show you. 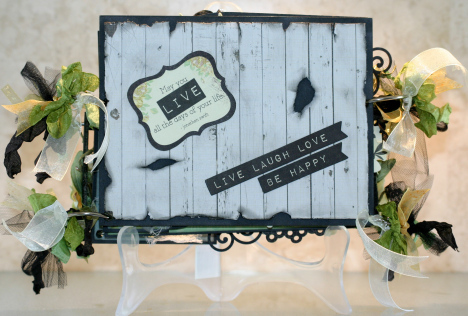 I am showing this technique using Twiddleybitz Chipboard BOR009 Flourish Spray Border. 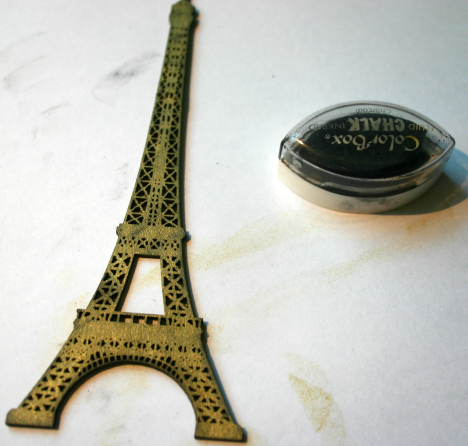 Dab Oasis Green Ink over the chipboard piece and allow to dry. 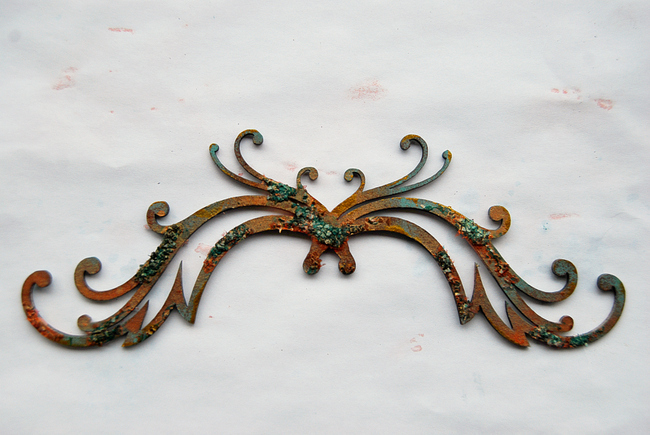 Go over the piece with Peacock Feathers Distress Stain. You may like to give the piece a couple of applications depending on the depth of colour. Randomly dab Brick Wall ink over the piece and allow to dry. 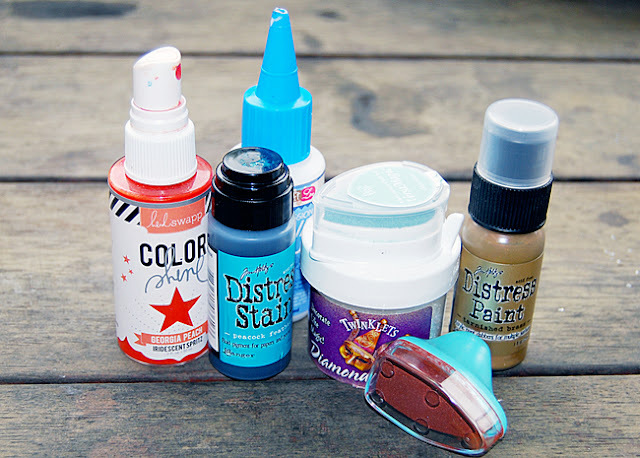 Apply some wet clear drying glue over some of the areas. Sprinkle with diamond dust. Tap off the access and allow to dry. Spray over the applied diamond dust with color spray and allow to dry. A couple of applications may be needed again depending on the depth you want to achieve. 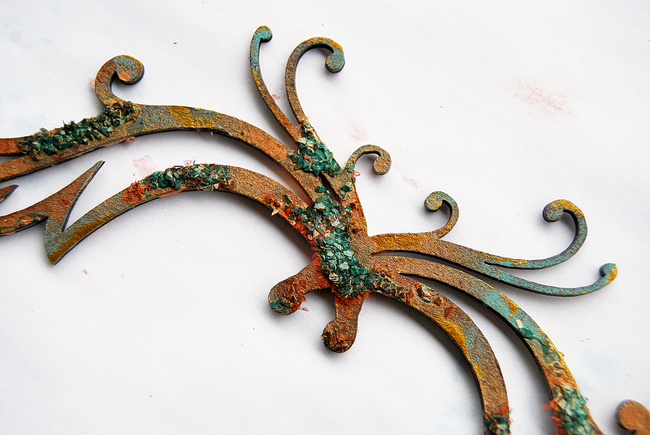 Dab a little Tarnished Brass Distress Paint around the edges and randomly over the top. 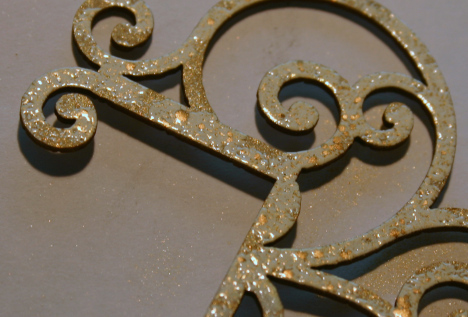 Metallic gold paint also looks terrific. 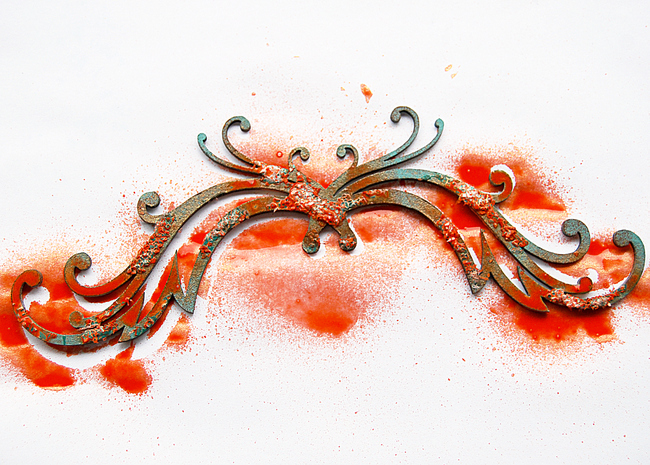 Dab a little more Peacock Feathers Distress Stain over some of the diamond dust. 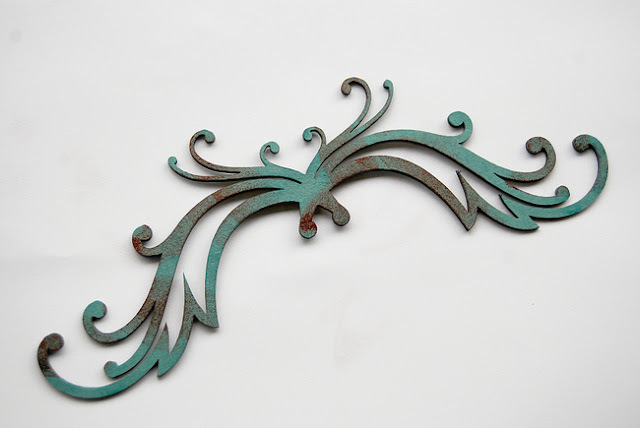 Your piece is now ready to be incorporated into your crafting project. Hi and Welcome Back Twiddley Fans! 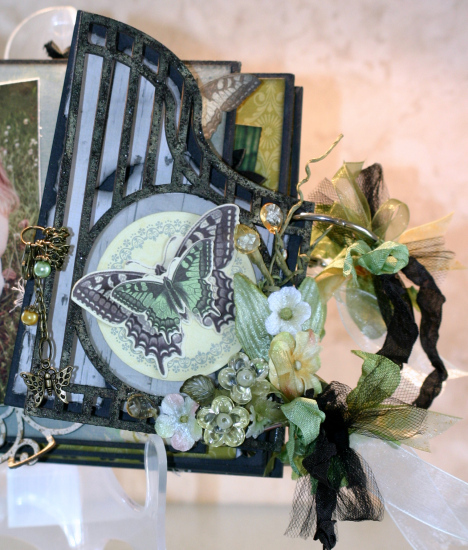 All this week Ngaire Gilligan has been sharing her creative process for altering our BK016 Gate Book. 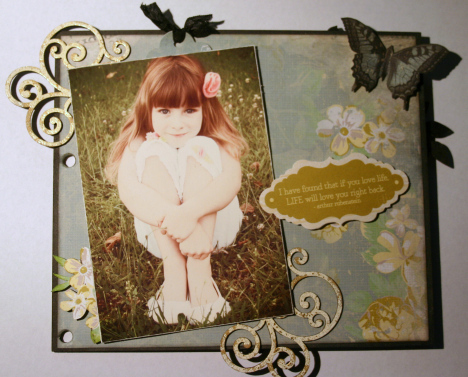 In this post Ngaire shows us the GATE BOOK as it is - finished. But you can see here that the chain does it nicely – keeps all the gorgeousness under control. I’ve used the Itty Bitty Alphabet (ALPHA005B) for my title. 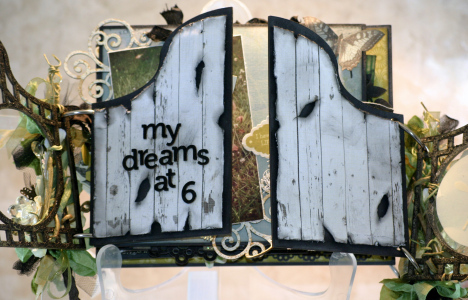 I popped it onto the inner gate cover panel so that it shows through the opening in the ‘gate’. Here’s the inside left cover. 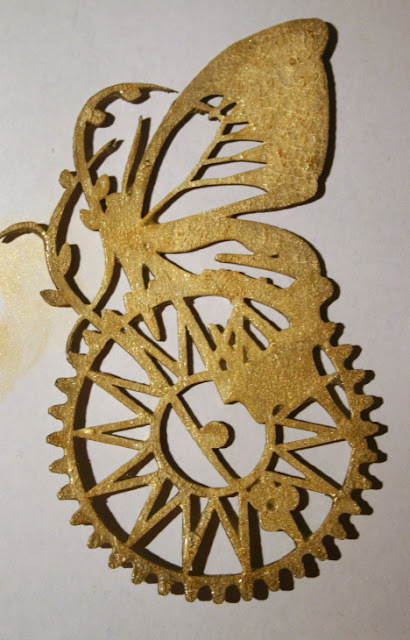 The embellishment cluster was designed around the stunning Twiddleybitz Flying Butterfly Clock – Steam (SPK002) piece. The right inner cover is a little less ‘fussy’, but still very pretty. 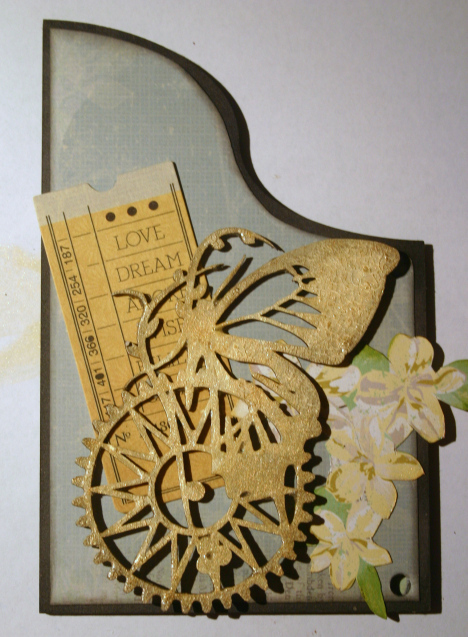 The centre page has these lovely corner chipboard swirls, which are from the Swirls Pack 8 pieces (SPK002) – this is a ‘show special’ pack from Twiddleybitz. 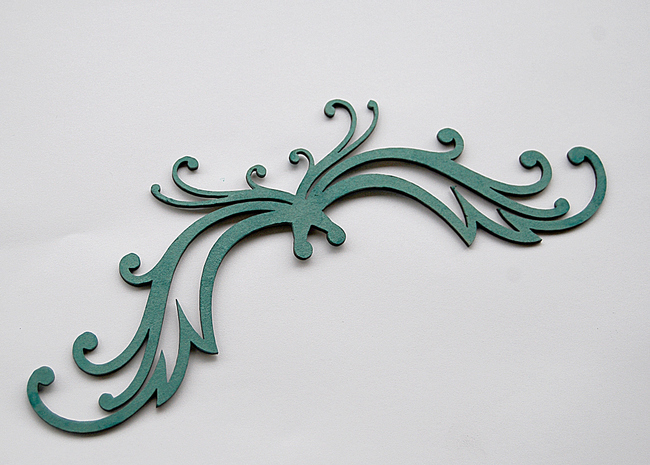 The next page features part of a Roman Clock Face Small (CF002), as well as a leaf stem from the Fine Fern Leaves Assorted (FER002) pack. One of my favourite pieces of chippy is on the next page. Got to love an Eiffel Tower(EIF001) for the ultimate girly glamour symbol – especially when it sparkles like this one. 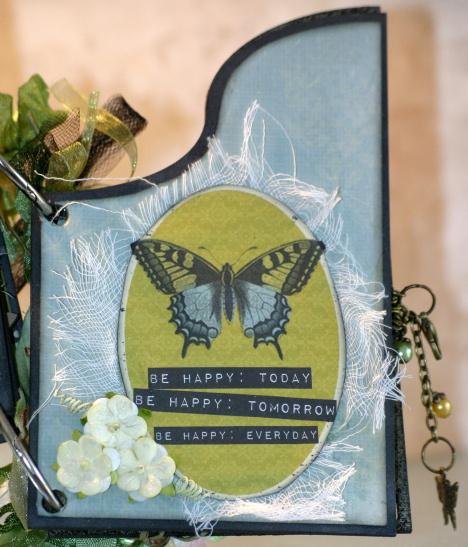 The rest of the small butterflies were used on the next page, along with a butterfly from the Butterfly Mix Bag of 3 (BUT001). 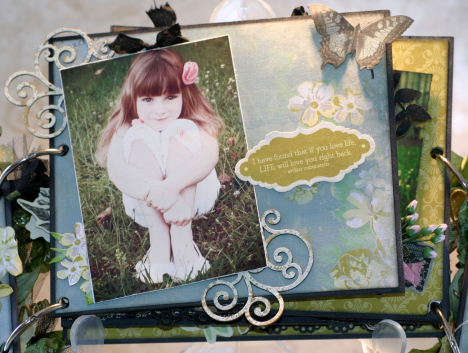 There wasn’t much room for anything other than the photo on this page – so no chippy – just a few bits of die cut. The matching page though, got another of those pretty Fine Fern Leaves Assorted(FER002) stems – this time with a different medium to embellish it. 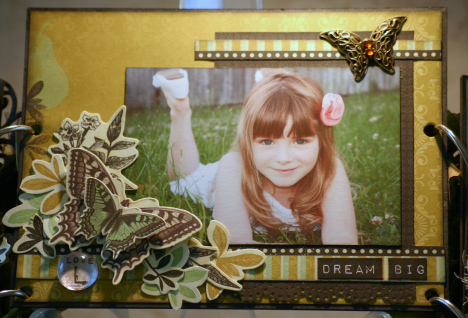 The final page is one of my favourites – I love the rich colours of the patterned paper and all the layers in the butterflies/leaves/flowers. And finally, the back cover – with a clear view of the gorgeous ribbons I added to the album rings. 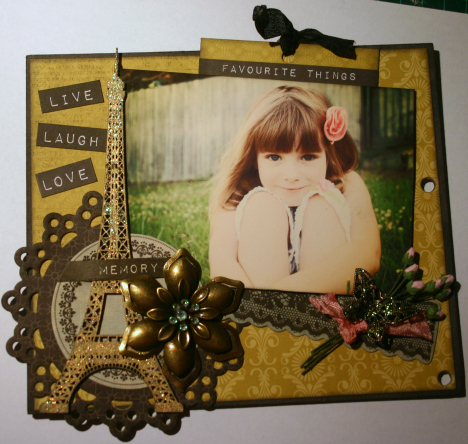 I’ve had so much fun with this mini album. As most of you who regularly visit my blog know, I usually make my own from scratch – so it was nice to have one all ready made for me – particularly since it had a defined number of pages and wasn’t the ever endless versions I seem to make. This one was even more interesting in the way it all went together – a bit tricky though with the differing opening pattern for the pages – because I had to think about how each page would look against the one behind it when opened up. 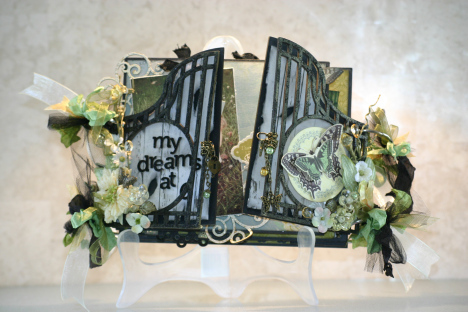 Welcome back to Ngaire's next installment in recreating her altered Gate Book. Let’s continue with the mini album. 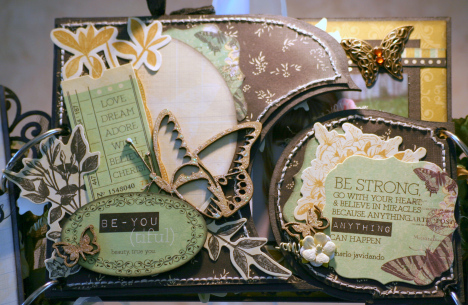 I love this patterned paper Olive. 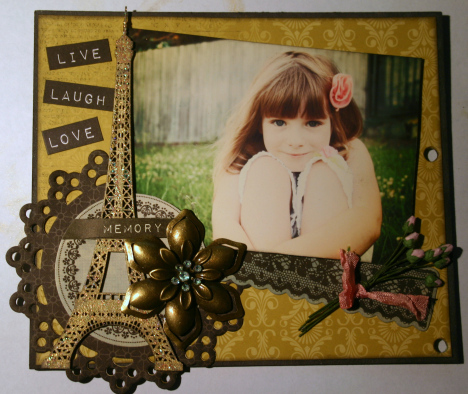 Such a lovely gold colour and the background pattern is very pretty. It really rocks against the black (inked) edges on the chipboard page too. I accidentally deleted a couple of the photo steps here – but they are pretty simple - so I can pop them all together here and you can still clearly see what I did. Down the left side of the page I randomly attached 3 of the word strips from the Sticker Sheet. 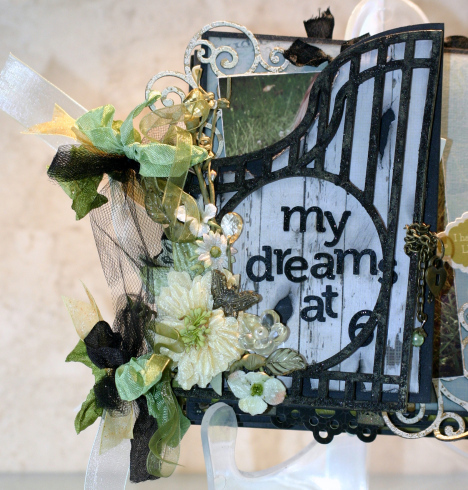 Below this, I placed a circular die cut element from the Collectibles pack over a decorative circular piece I cut using a Die-namics die. Because it was going to overlap the edge of the page, I actually cut out two of them and glued them together so that both sides show the same black patterned paper. 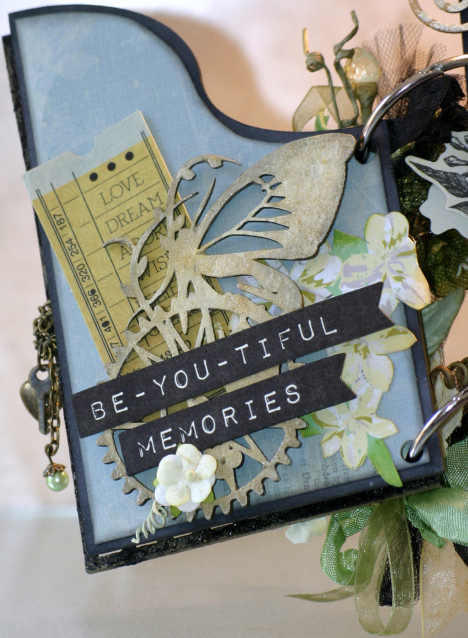 Before attaching the circular die cut – I cut along the black strip that contains the word ‘memory’, as I intend inserting another embellishment under the word strip. 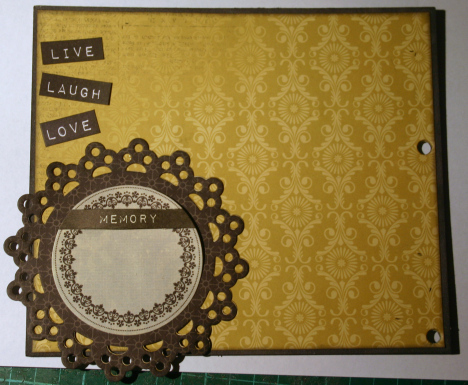 A die cut strip of grey lace was placed under the circle die cut, but over the fancy die cut. The photo is going to go over part of the lace strip – so I used the photo to help me ‘place’ it in the correct position. Now for the photo – one of my favourites from 2011.
and finish up with some Crystalina Kindyglitz – which is heated with a heat-gun untilsome of the ‘sparkle’ transmutes into a duller, golden glimmer. You get a random pattern of sparkle and glimmer – which looks very interesting – and less overwhelming than the full sparkle alone does. 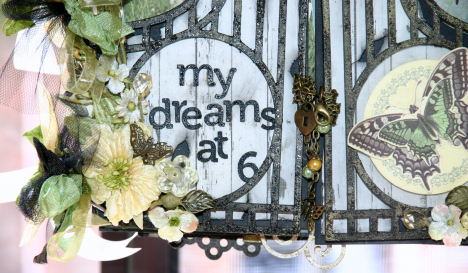 I’ve slipped the tower up under the ‘memory’ word strip in the die cut circle so that it also ‘ende’ off the photo..
Next comes a large metal flower – and in the centre of this I added some moreCrystalina Kindyglitz – leaving it to dry naturally and thus retain the full sparkle. On the other side of the page I added a small rosebud bouquet I made from seven medium-sized, pink rosebuds and a small left-over pink crinkle ribbon. 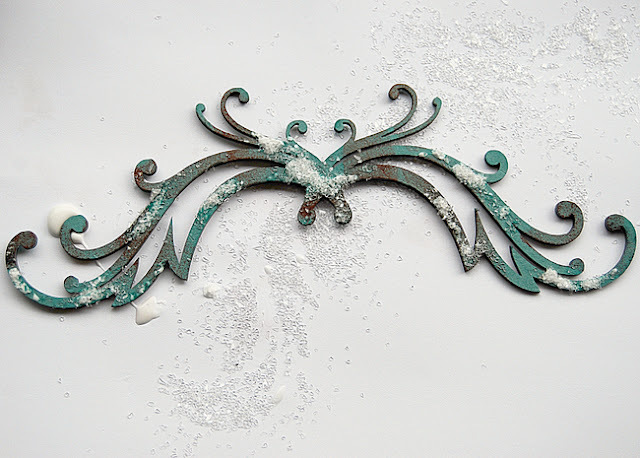 And then to finish it all off – I added a small bronze butterfly charm which had been liberally coated with yet more Crystalina Kindyglitz. 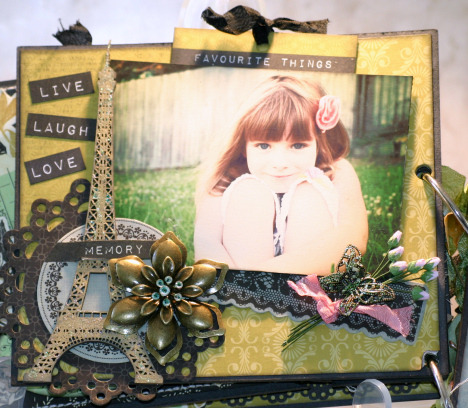 The journalling for this page is going on a tag that I intend hiding behind the photo. 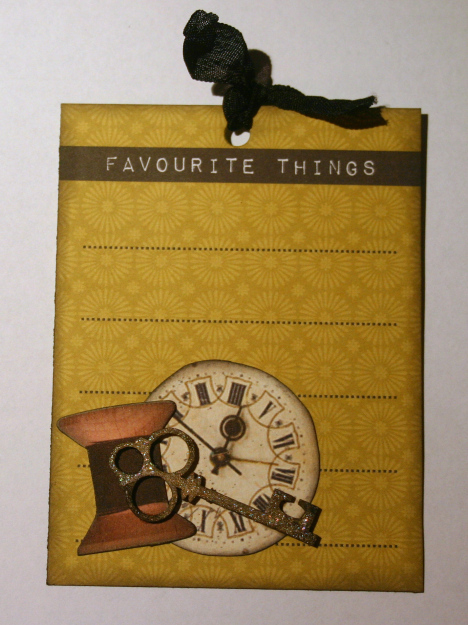 Keeping it simple – I took a journalling panel from Pistachio and inked the edges of it – before adding several die cut elements (the cotton reel is from the Collectibles Pack and the clockface is from one of the papers); one of these cute little Mini Keys(MINI004) from Twiddleybitz; and a bit of black crinkled ribbon. 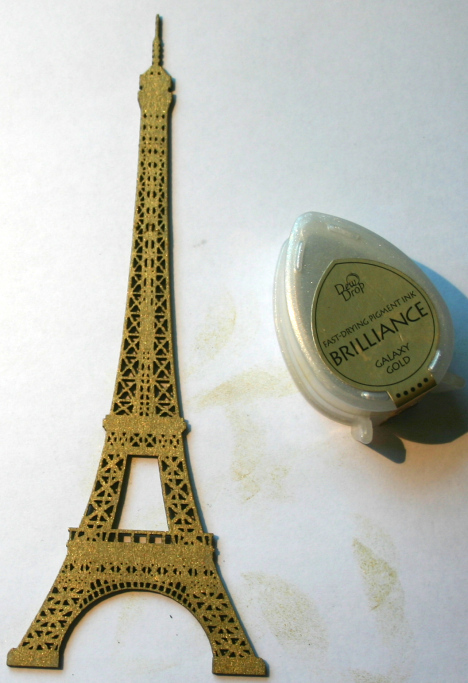 The key got the same treatment as the Eiffel Tower and looks way better in real life than in this photo. 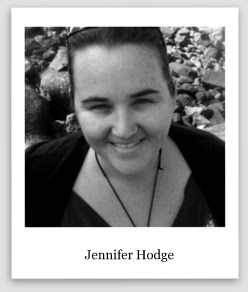 Here the tag has been popped into its hiding place behind the photo. 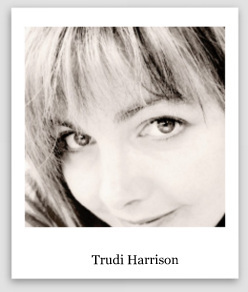 Finally – the page – as it looks in the finished album. 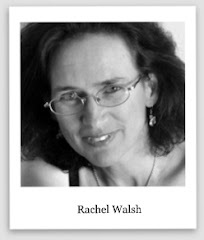 The next page comes as part of a ‘set’ – so I’ll put all those together in my next post. I hope you are enjoying working through the mini – if you have any questions about it – please feel free to ask me. 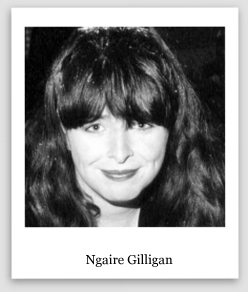 Ngaire Gilligan is back with us today sharing the next step in recreating her altered Gate Book. The inner side of the front cover pages have been designed to match the first full page of the album. The base paper for all 3 pages, is the pretty, blue reverse side ofQuince. 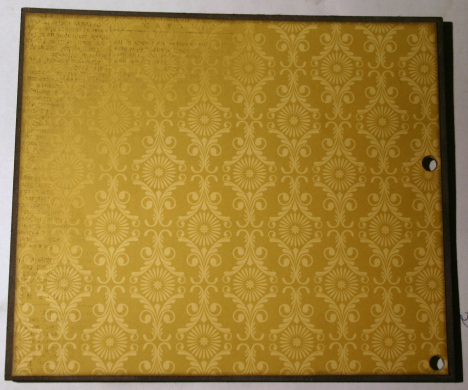 The main page included part of the floral design on this paper, but the inner cover pages use the plain blue section of the paper. The main embellishment on the left inner cover is this gorgeous Twiddleybitz Flying Butterfly Clock – Steam (SPK002). The final finish comes from a layered approach to the mediums applied to it. I started with an application of cream paint (Antique White from Kaiser). 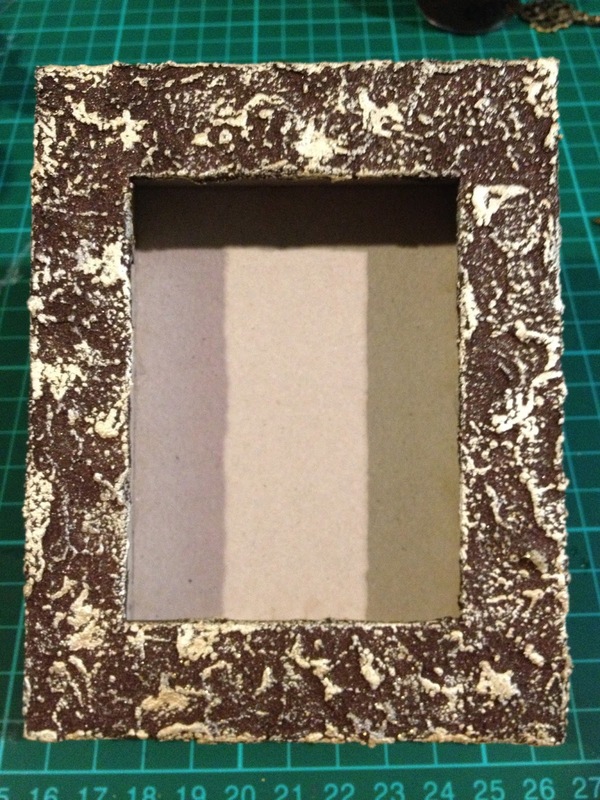 When you want a pale or light coloured finish to chipboard it is often best to apply a white/cream paint to start with, so that the chipboard colour itself does not alter/overshadow the final colour. 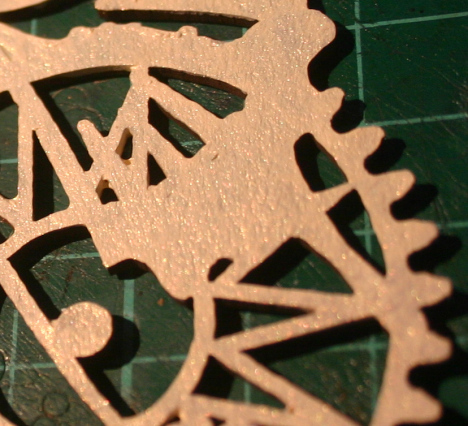 The next step is to apply Iridescent Gold Glimmermist so that you get a shimmery gold look to the chipboard. Although you are going to add in further medium layers, applying a shimmer now will allow it to show through in the background. 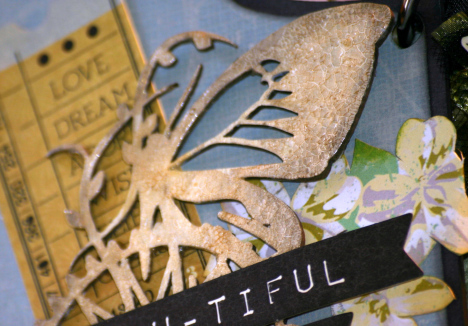 The next step was to coat the butterfly in Rock Candy Crackle Paint and allow to dry. It’s best not to use your heat gun on this, as the crackle does not work well with a heat gun – but once the crackle process is well underway, you can use a light application of heat to ‘extend’ the crackle. How cool does this look? Although this stage in the process is lovely – it is too pale for the colours used in the mini – so I need to darken it a little. I’ve done this by applying a darker colour to the crackle finish (in this case Galaxy Gold Brilliance Ink) and rubbing it into the cracks in the crackle paint so that it emphasises the cracks and darkens the finish. 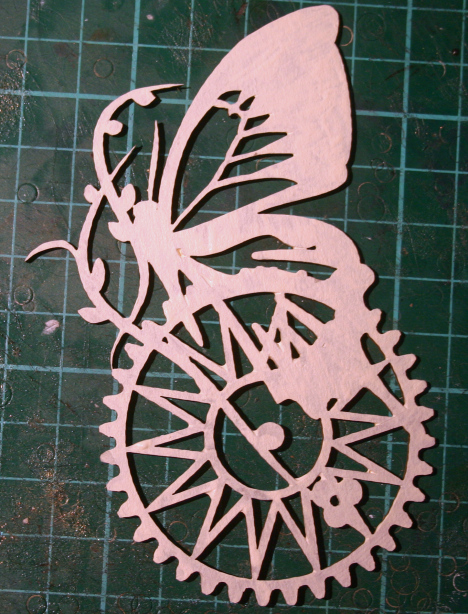 To further grunge it up a little I also rubbed a small amount of black ink into the edges of the chipboard. So here is the final piece – full of interest and texture and an underlying glimmer. 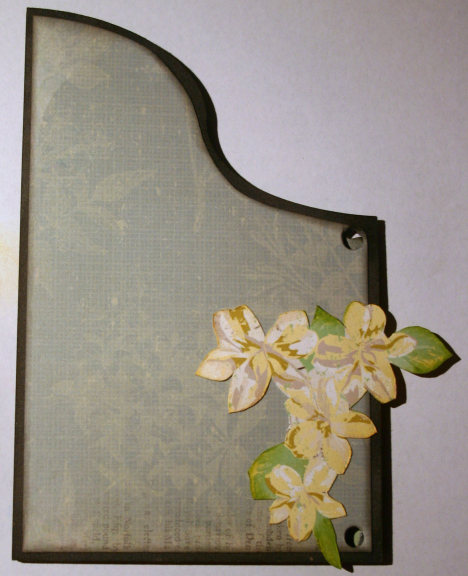 When starting with the embellishing of the left inner page I popped a section of hand cut flowers (from the floral pattern on Quince) on the right hand edge of the page. Like most cut out pieces I do, I’ve applied some matching ink to the edges of the cut out elements to help hide the sharp white edge you get from cutting them out of the paper. 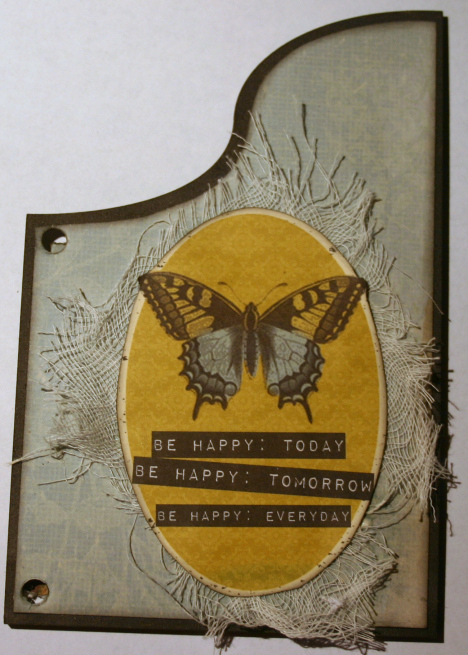 One of the ticket die cuts (with complimentary colours to the paper) from theCollectibles pack was next. Next comes my gorgeous butterfly. And then some of the word pennants from the Collectibles pack. And the finishing touch – a small cream (no brand) flower – which has been sprayed with a light misting of Iridescent Gold Glimmermist. Here is the page in the album. The middle page has this gorgeous floral pattern down one side and I love that so much, that I didn’t want to hide it very much. 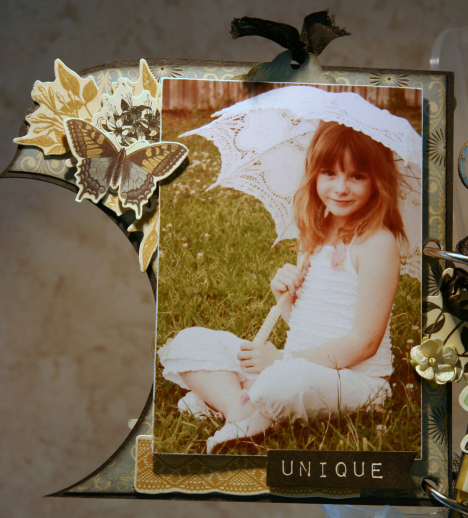 The photo takes up most of the rest of the blank space on the page, so the trick is to try and embellish around the photo – leaving as much of that pretty pattern as possible. 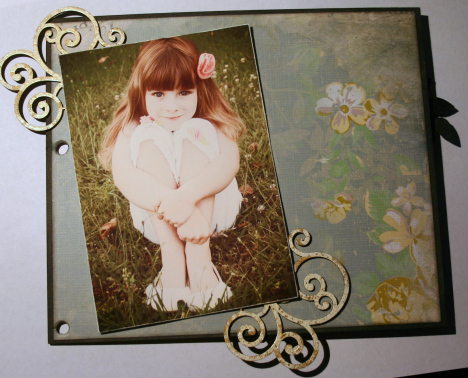 To make the most of the space, I’ve chosen to use some corners from the Swirls Pack 8 pieces (SPK002) which I am going to tuck under the photo corners and have protruding over the edge of the page. For this page I want to emphasise the white/gold combination on the page (since the photo has some white on it too) so I’ve chosen gold ink and a white/gold embossing enamel finish for the chippy. 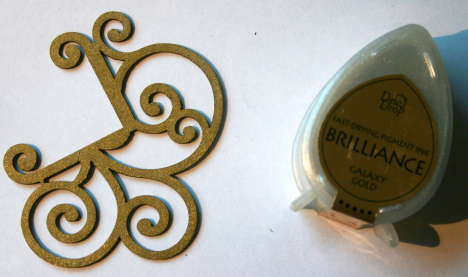 and finished it off with this lovely Stampendous Aged Ivory Embossing Enamel. 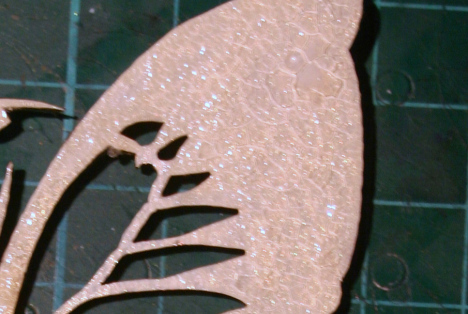 It’s a mixture of off-white with this stunning gold fleck mixed in here and there. Love it. And here the corners are, tucked in under opposing corners of the photo. 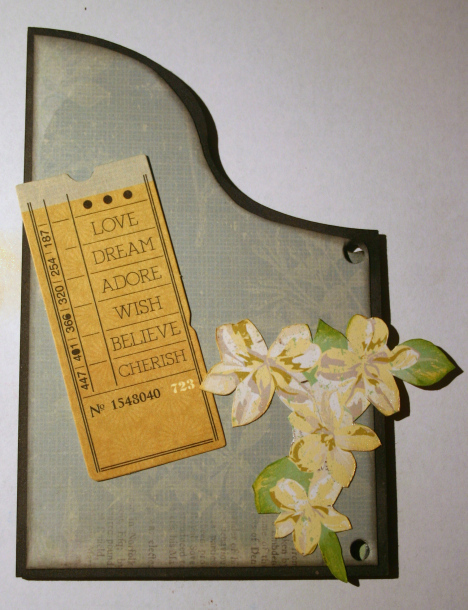 I found this lovely little journalling spot in the 6.5″ Paper Pad - it was perfect popped into a space in the floral pattern. 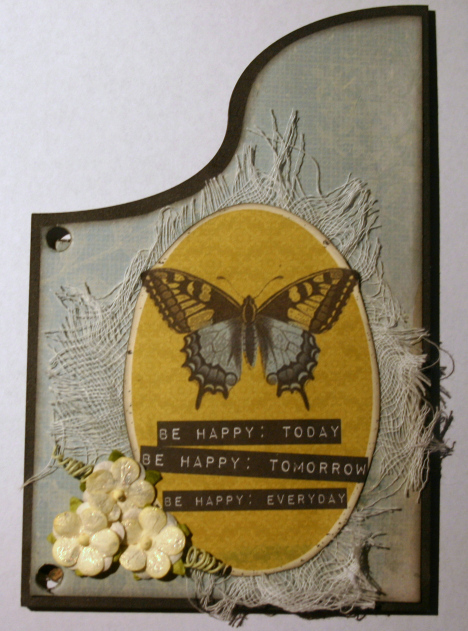 I also added in a small bit of hand cut flowers that were left over from the left (inside) cover page. 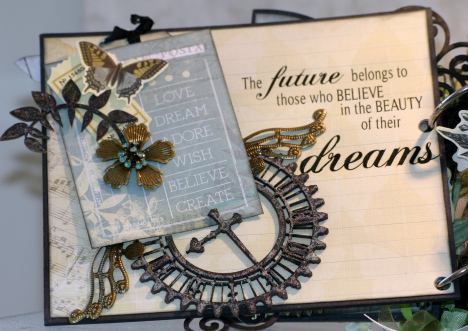 The final touches were a hand cut butterfly for the top right corner – which was looking a bit bare – and a journalling tag from the Collectibles pack. 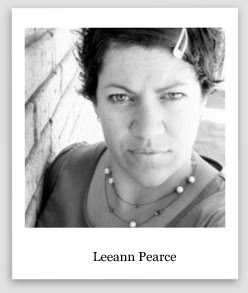 I added a length of black ribbon to the tag and popped it in behind the photo. Most of the photos in this album have been adhered with dimensional tape for the purpose of allowing me to hide the journalling tags behind the photo. 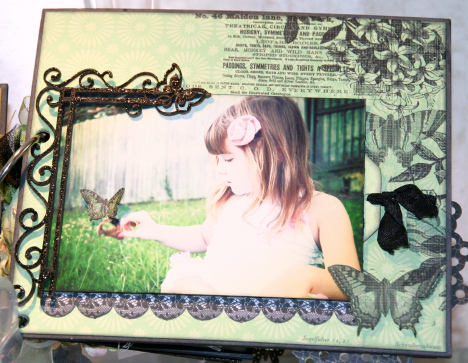 And here is the page in the finished album. The inside, right cover has been kept pretty simple – partially because the left side is so complex and dimensional and partially because I really wanted to feature the die cut quote panel. After cutting out and trimming the panel, I lightly inked the edges so that it would stand out from the background paper a little better. Underneath it I put a bit of muslin fabric, which I had pulled apart at the edges a little to make it look fragile and delicate. 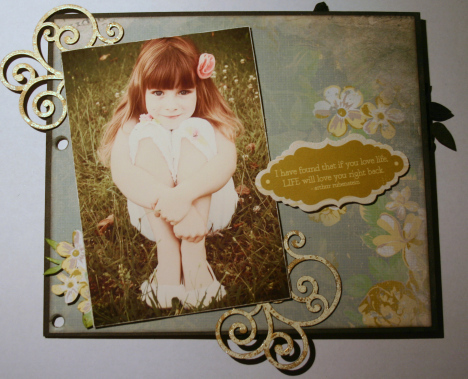 The only addition to the page is a trio of the small flowers I’ve used throughout the album. It’s nice to repeat elements so as to make sure that the various pages are linked throughout the whole mini. 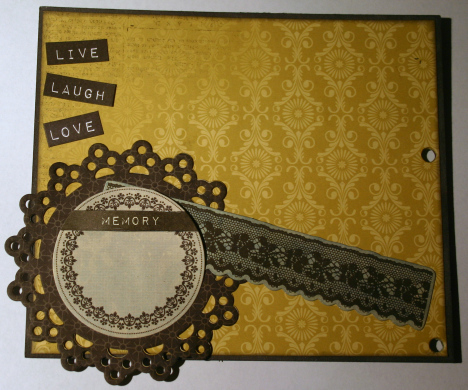 Here is the same page in the finished album. And there you go – the first set of pages are done. 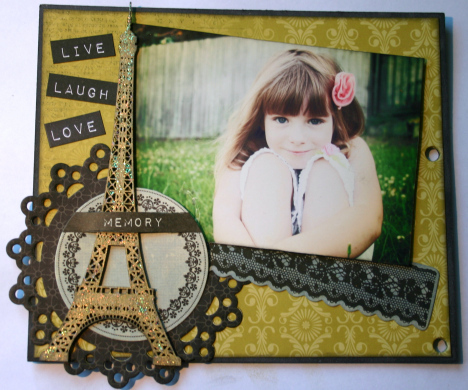 Providing the scrapbooking and craft community with quality and affordable cutting edge chipboard and related products.